Recognize this spot? 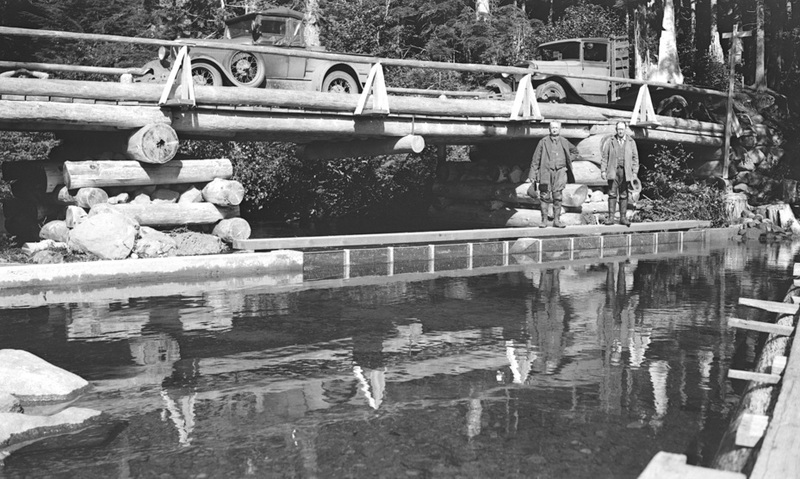 This is the dam at the outlet of Lost Lake, October 1, 1933. Alva Day (right) is proudly showing off the completed construction project which rebuilt the dam and the road across it. It's holding the car and the truck, so it must be ready for traffic. I wonder how many times this bridge has been rebuilt since then? Used to build logging bridges in Alaska the same way as this bridge. But since we had big off highway logging trucks we used big logs. Always used 6-8 ft. spruce and at least 1" wire rope to lash the logs together. After about 6 yrs. we kept our eye on the bridge when a truck crossed it. When the logs lost their spring, it was time for new stringers. Only broke two stringers on one bridge, but the truck made it across. Not sure if there is more than one bridge at Lost Lake but this is probably the bridge where my mother received her engagement ring from my father in 1940. My daughter is now wearing that ring. Like Buzz, I have watched bridges, very similar to this one, being built in British Columbia. The only difference is the log piers holding the rock, were notched much tighter. I have seen pine, spruce and cottonwood used. The pine logs were not nearly as big, but easier to work with. Two very recognizable guys, when you open a photo. Alva Day and Mr. Frericy. LE, thanks for pointing out Mr. Fredricy. He worked as railroad agent at the train station, and seems to be everywhere Alva Day is. Thanks for spelling his name correctly. iPhones are not the best for viewing HHR, nor spelling. Cottonwood for a bridge?! I t hink of cottonwood as soft and tendency to be punky. Must be wrong. Kenn, we have a full series showing the construction of this bridge. Let me know if you'd like to see some more of them. I suspect one is plenty for the rest of us. Buzz's comment on the flexing of the logs is nothing I had thought of or heard of, interesting and logical information. I would for sure like to see the series showing the construction of this bridge, how, when, and where is this possible?